Does God require faith that is 100% without doubt? Faith Church. That’s the name of our church. Back in 1968, when they got this church started, why would people choose to name a new church, Faith Church? I wonder what they were thinking. What is faith? Most often we think faith is belief. And for good reason. Faith does mean belief. It means that in our minds we agree with certain statements or facts or ideas. Think about that. Faith is belief. But it also must have works, James says, or it is dead. So what is faith? Just belief in our mind, or must faith also have some kind of work? So somehow, Paul says, we receive the gift of grace by faith, and not by works. But as I mentioned above, James said faith without works is dead. See the apparent contradiction? This brings us back to the question I started with? What is faith? Does that clear it up for you? I have to admit that on first reading, that definition of faith doesn’t really help me. So we have to look a bit deeper. First, Faith is being sure of what we hope for. We have hopes. We want them to come true. It may be a promotion we hope is coming. It may be hopes for our children and grandchildren. It may be hopes that we will get out of debt. It may be a hope that eternal life is in our future. What hopes do you have? Faith is being sure of those hopes, that they will become reality. It is saying, “I know that I know that I know that what I hope for will come true.” But if we’re honest, we rarely feel that certain. The opposite of being sure is being unsure. Uncertainty also goes by the name “doubt”. Frankly, when we read the Bible, it can be a bit tough to understand how the interplay of faith and doubt works. On one hand we read Jesus teaching that if you have faith, you can move mountains. On the other hand we read the psalms and the psalmists express their doubts quite a lot. Does that mean they are lacking in faith? Is the writer of Hebrews saying that the only true faith is a faith that doesn’t have even one little tiny iota of doubt? Is that even possible? Haven’t we been told that expressing our doubts is healthy, and that God welcomes us to converse with him about our doubts? How would we know if our faith is totally without doubt? What would that feel like? Before we can answer that, let’s see what else the writer of Hebrews says about faith. Second, faith is being certain of what we do not see. What the writer of Hebrews is saying is that there is a side of life that is beyond what we can perceive with our five senses. You can’t touch it, smell it, taste, see or hear it. It is the spiritual side of life. The realm of God, angels, demons, heaven and hell. Faith believes it is real, though we cannot see it. Again, though, the writer says that faith is certain of this. And I ask the writer, “how certain?” Is it okay to doubt a little bit? Is it okay to wonder or speculate? And don’t we all do that at least a little bit? “He must believe and not doubt”? If 100% belief is required by God to answer our requests for wisdom, then it seems to me that very, very few of us will ever receive wisdom from God. Does faith require 100% perfect belief, with no doubt whatsoever? I don’t think so. Here’s why. I personally appreciate the honesty of a guy Jesus once encountered whose child was really in a bad way. The child was possessed by a demon. The man brought his child to Jesus, but ran into Jesus’ disciples first. They tried hard, but couldn’t cast out the demon. When Jesus shows up a bit later, the man is desperate, pleading with Jesus to help. You know what Jesus says to the man? I love that line. It resonates with what I so often feel. 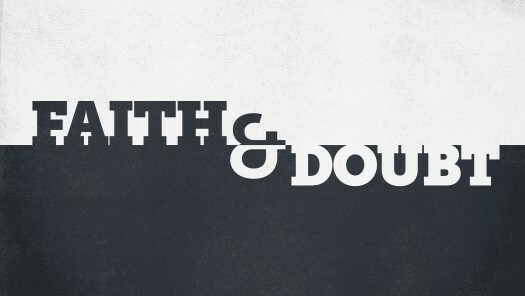 The tension between faith and doubt. The knowledge that while I have faith, I don’t think it is perfect faith. Jesus knew this about the man, and you know what Jesus did? But Jesus did not say that. He saw the man’s tension of faith and doubt, and he healed that man’s child. Let’s remember this man’s tension between faith and doubt, and think about it in light of the definition of faith in Hebrews 1. God doesn’t require us to have perfect faith. He does require faith, though. And tomorrow we’ll talk more about what it means to place our faith in God.